One would think, given their endless clamoring for more laws, regulations, and restrictions, “enforce the laws on the books” would be a notion that “gun control” extremists would agree with. Sadly, one would be wrong. Consider, for example, the peculiar case of Scott Pappalardo. 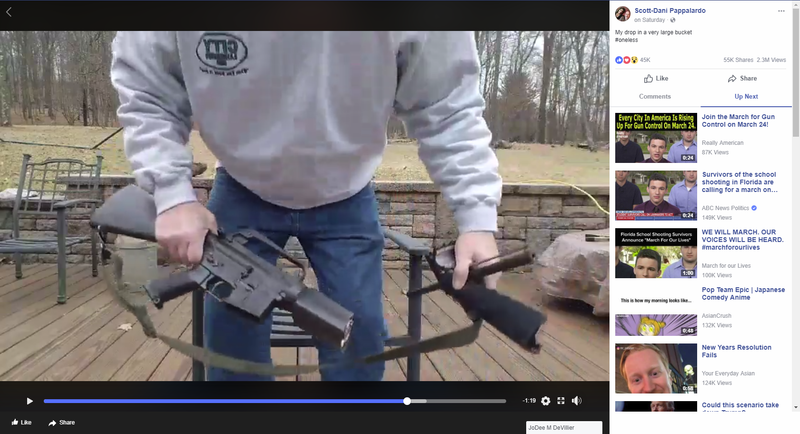 On 17FEB18, in response to the Marjory Stoneman Douglas High School shooting three days prior, Scott filmed himself cutting up his 30-year-old AR-15 in an attempt to virtue-signal his support for “gun control”. In the process, he also committed a federal felony. 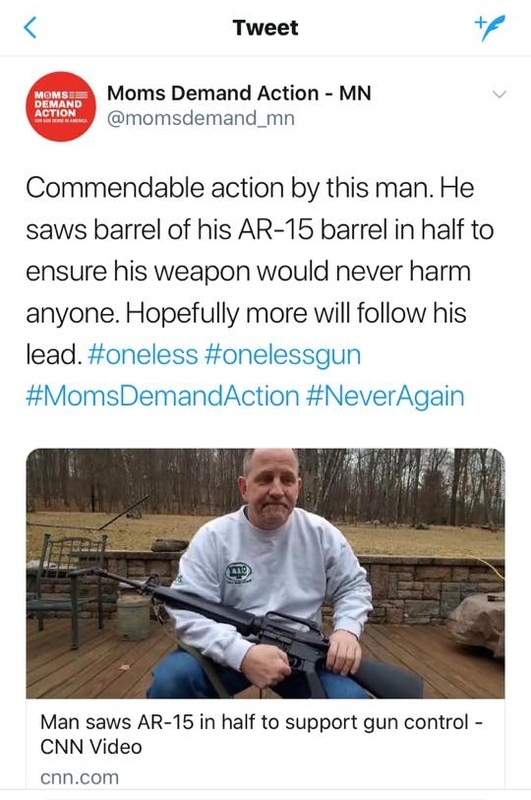 Specifically, Scott Pappalardo illegally made a short-barreled rifle (SBR) without paying the appropriate tax stamp, and in so doing, he violated at least sections (c), (d), and (f) of the 26 United States Code § 5861. Per the Bureau of Alcohol, Tobacco, Firearms, and Explosives National Firearms Act Handbook, this offense can carry up to a 10 year prison sentence and up to a $250,000 fine. Bear in mind this is a strict liability offense – neither mens rea nor intent factors into the specific law. Intent only applies to the creation of the rifle itself; once the rifle already exists, taking a hacksaw to the barrel, regardless of whether you intend to make an SBR or knew that doing so would create an SBR, is a crime, all by itself. It is worth noting that Scott did, eventually, also cut up the receiver; however, he only cut it once, and with the same saw. There seems to be some disagreement over the legal requirements to destroy a firearm, but, regardless, he cut the barrel first, thereby making the SBR, before he arguably destroyed the evidence of the crime. To my knowledge, as of this post’s date, Mr. Pappalardo has not been arrested or charged with the appropriate crime(s). That is, unfortunately, to be expected; prosecutorial discretion – i.e. selective enforcement of the law – is a time-honored loophole for useful idiots that the government wants to protect, or at least does not want to pursue. But what is really interesting is how the “gun control” community has reacted to this law-breaker. They are holding him up as a hero. Around the country, “gun control” extremists are referring to Scott as “level-headed, conscientious”, “a man with a conscience and a soul”, a “good man”, and so forth. Others hoped other firearm owners would replicate his “powerful statement”. Even the local chapter of a “gun control” astroturf farm stuck their hand in the blender, describing Scott’s actions as “commendable”. They later deleted that tweet – I wonder why? 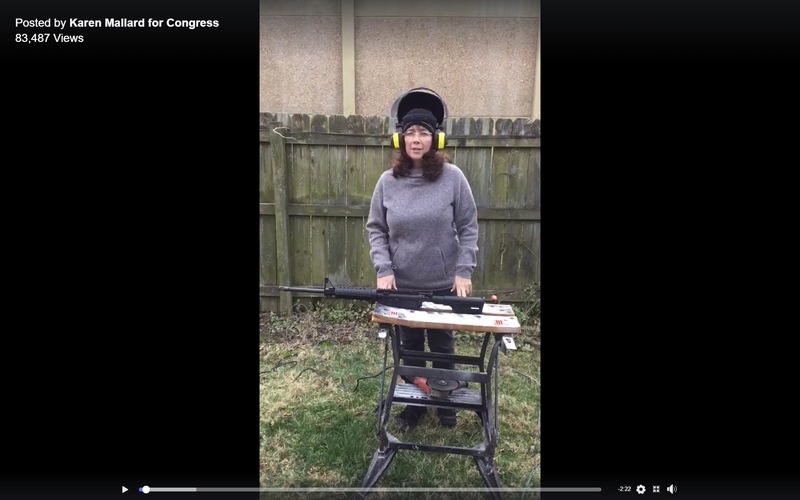 Once again, she cut the barrel first. 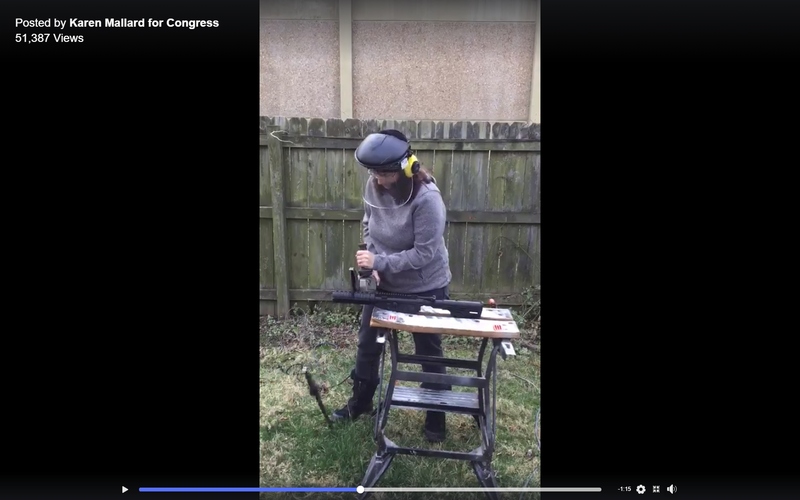 In Karen’s case, I have no idea if she ever got around to cutting up the receiver – the part of the firearm that is legally considered The Firearm – so she may still have an illegal, and illegally-made SBR on her hands. So far as I know, there is no clause in the Constitution preventing felons from serving in Congress, but I imagine the 10-year sentence might get in the way of her aspirations. Assuming she is prosecuted, of course… which she will not be, of course. In both cases, if Scott or Karen had simply adequately destroyed the receiver first, we would all be shaking our heads at the senseless destruction of perfectly functional firearms, but no crime would have been committed. Hell, if they had simply removed the uppers from the lowers first, they still would not have committed a crime (though we are entering into an uncomfortable grey area there). However, cutting the barrel of a rifle to less than 16 inches, while it is still attached to the rifle, is very much a crime, with some very stiff penalties. 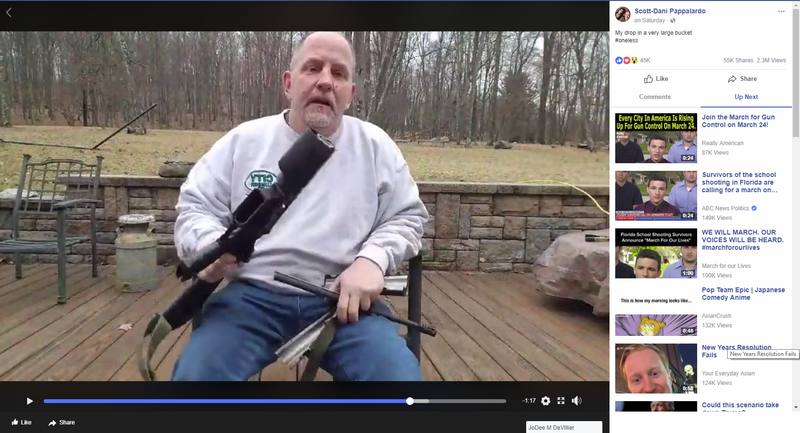 Lest anyone think I am joking about the severity of this felony, allow me to remind you that a man’s dog, son, and wife were all murdered by government agents – the last while unarmed and literally holding their 10-month-old child in her arms – all because he cut the barrel of a few firearms about 3/8″ too short. Karen Mallard and Scott Pappalardo cut their barrels about a foot too short, and thanks to them “trying to do the right thing”, they will escape prosecution. And, you know what? I am sanguine with that. You see, this situation is a win-win for the pro-rights community. The Federal Government will prosecute these numerous “unconvicted felons”. In that case, yes, the laws on the books will be enforced, which will be a perfect opportunity to demonstrate just how ridiculous malum prohibitum laws are, and, let us be honest – 99% of firearm laws are malum prohibitum. Histrionics and hysterics aside, SBRs are no more dangerous than any other rifle or handgun, and the additional tax stamp and background check to make or purchase them is patently ridiculous. The Federal Government will decline to prosecute these virtue-signallers who helpfully recorded their felonies on tape. In that case, I guess we are not enforcing the laws on the books, which calls into question why we have the laws to begin with, if we are not going to bother prosecuting people who violate them. And all the while, the “gun control” extremists and organizations are trapped in an absolutely delicious Morton’s Fork. Either they mount their white knight atop his valiant steed and come to the defense of these ignoramuses who committed rather serious federal felonies, or they throw these useful idiots under the bus and ignore the Holy and Glorious Deed they were attempting to accomplish. Because a felony committed for The Right Reason is acceptable, right? Like I said, it is a win-win… for the folks on the right side of history. 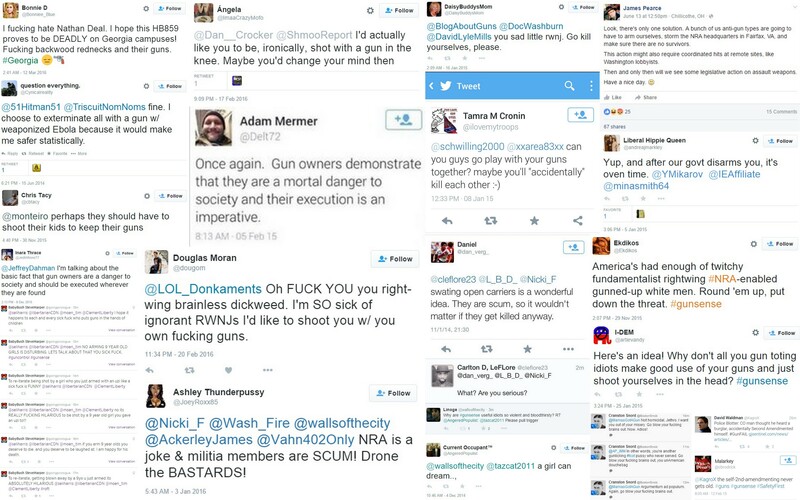 So what is it going to be, “gun control” extremists? Shall we enforce the laws on the books, and throw these would-be do-gooders – in your universe, at least – in a federal penitentiary, as they deserve? Or shall we ignore their offenses, because reasons? And if we do ignore people breaking the law when it is convenient, remind me again why we should take your mewling for more laws seriously? Once again, I will have some pictures for you to consider, but first a little backstory. One of the favorite arguments of those who support “assault weapon bans” is that a purpose/goal of the prohibitions is to keep “military” or “military-style” firearms out of the hands of private citizens. Ignore, for a moment, that at the time of the Second Amendment’s ratification, every long arm, short arm, or other firearm-like device was both “military” and in the hands of private citizens. Likewise, ignore that the Second Amendment was written to preserve exactly that kind of arrangement. And, finally, ignore the entire concept of “military-style” – after all, how does the physical appearance of a device affect its actual performance? After all, this looks a lot like this, but I guarantee you they are radically different (the first is an airsoft device, to begin with). And your first question: which of these are “military firearms”? If you answered anything but “B”, I hate to break it to you, but you are wrong. A is not legally considered a firearm, considering that it is a first-generation Mosin-Nagant Model 1891, and was thus produced before 1899. Even if the firearm-looking device is an exact duplicate of a firearm still currently being made and using still-available ammunition, if that specific firearm-looking device left an assembly line before 1899, the Bureau of Alcohol, Tobacco, and Firearms considers it to be an “antique”. Granted, Mosins are not still being produced, but the Model 1891 featured above does chamber still-commercially-produced 7.62x54r ammunition. However, thanks to its “antique” designation, it can be mail-ordered without involving a Federal Firearm Licensee – after all, it is not a firearm. Firearm or not, it is almost a guarantee that the entirety of the first generation of Mosins saw service in the Soviet Union at some point, simply because between 1891 and now that country has been involved in almost non-stop conflicts, both external and internal. B is a Finnish M91 produced between 1926 and 1927, and it almost unquestionably was a military firearm, courtesy of that country’s incessant border disputes with Russia, and that whole unpleasantness in the 1940s. C is an AR-15 I purchased a few years back as a bare receiver and built up, and has never seen a day of military service in its short life. Further, the AR-15 platform is used by basically no military, simply because those militaries can and do avail themselves of the significantly more capable M-16 and M4 platforms. Now, the fun question: which of those firearms is subject to “assault weapon bans”? If you have read the first two posts of this series, you probably already know the answer; the only firearm above subject to “assault weapon bans” is C.
The other two are actual military weapons that very likely were used by military personnel to kill other human beings, but it is the firearm that was never used by a military, from a model of firearm that was basically never used by the military, that people are so very concerned with. If one wants to get truly specific, the combination of the National Firearms Act and the Hughes Amendment to the Firearm Owners Protection Act already make it functionally impossible for American citizens to procure most of even the types of firearms being used by militaries today, much less the actual, specific hardware. But old military hardware? 90% of it, or more, is available for the purchasing, and some of it does not even require background checks, per the BATFE themselves. So, no, “assault weapon bans” have absolutely nothing to do with the military heritage – or lack thereof, in almost all cases – of the firearms being banned. Unfortunately, like so many of these talking points, that particular one is not likely to be dissuaded by facts. One of the favorite tactics of “gun control” organizations when demonizing AR-15s, AK-47-pattern rifles, and other “assault weapons”* is to decry them as being “high-powered” rifles unsuitable for civilian use. As with so many things those organizations proclaim, that is simply not true. 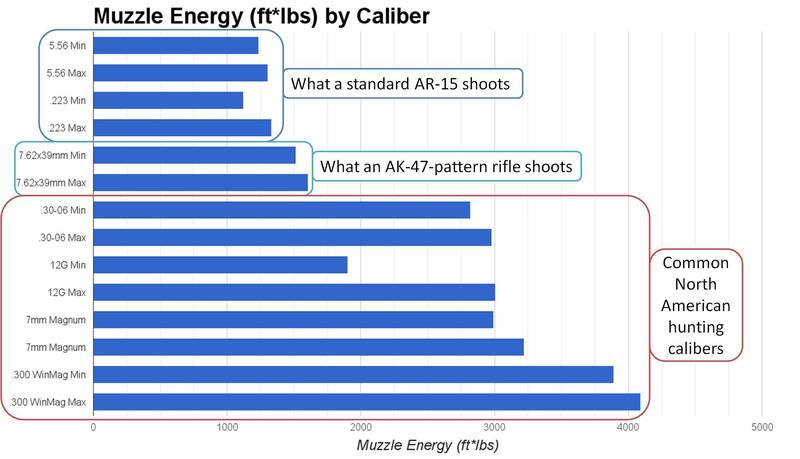 The following graphic was built with numbers provided by the respective calibers’ Wikipedia pages, with the exception of 12 gauge, where the numbers came from Winchester Ammunition‘s line of 1 ounce slugs. These numbers should be considered approximate averages, given the differences generated by barrel lengths, powder loading, bullet weight, and so forth, but the data will be sufficient for the point I am making. It is worth noting that the .223 / 5.56 were developed in 1963, the 7.62×39 in 1944, the .30-06 in 1906, the 7mm Remington Magnum in 1962, and the .300 Winchester Magnum in 1963. It is difficult to truly date the 12 gauge caliber, but the concept of a shotgun has been around since at least 1728. It is also worth noting that the AR-15, by dint of its modular nature, can support a wide variety of other calibers; however, even the most energetic (.50 Beowulf, I believe) still falls a few hundred foot-pounds short of the venerable .30-06. Additionally, it is the niche product of a niche market; in other words, you are unlikely to see one, ever. So, no, neither AR-15s nor AK-pattern rifles nor pretty much any other form of “assault weapons” could be considered “high-powered” rifles when compared against the rifles that millions of American hunters take into the forests every year, many of which are chambered in calibers developed decades before the AR/AK’s. As usual, if the “gun control” organizations did not lie, they would have nothing to say. Author JonathanPosted on June 18 2016 March 8 2018 Categories dataTags ak-47, ar-15, assault weapon, compare, contrast, foot-pound, gun control, high-powered, hunting rifle, muzzle energy4 Comments on what is “high-powered”?